Union members stand in front of St. Joseph. The report, which is available online at the National Nurses United Website, breaks down a series of complaints, places where the nurses say the health system has strayed from its mission. St. Joseph Health System, which is comprised of a network of hospitals, was established in 1920 by Catholic nuns. Union members allege that the system today is more concerned with profit than patient care, and that it has been exploiting its not-for-profit status to avoid paying taxes on money shunted into hedge funds and offshore accounts in the Cayman Islands. 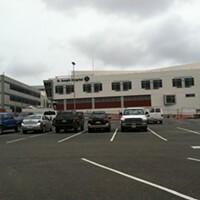 Representatives from St. Joseph Hospital responded to some of the concerns in an emailed statement from President David O'Brien saying that, despite dramatic shifts in the world of healthcare delivery, its commitment to patients and employees has not wavered. The hospital has also been waging a public relations campaign of its own for several months following allegations from the National Union of Healthcare Workers that they pay “poverty wages” to caregivers and housekeepers, running ads that emphasize its “commitment to care." Among allegations from the nurses is a lack of adequate supplies. 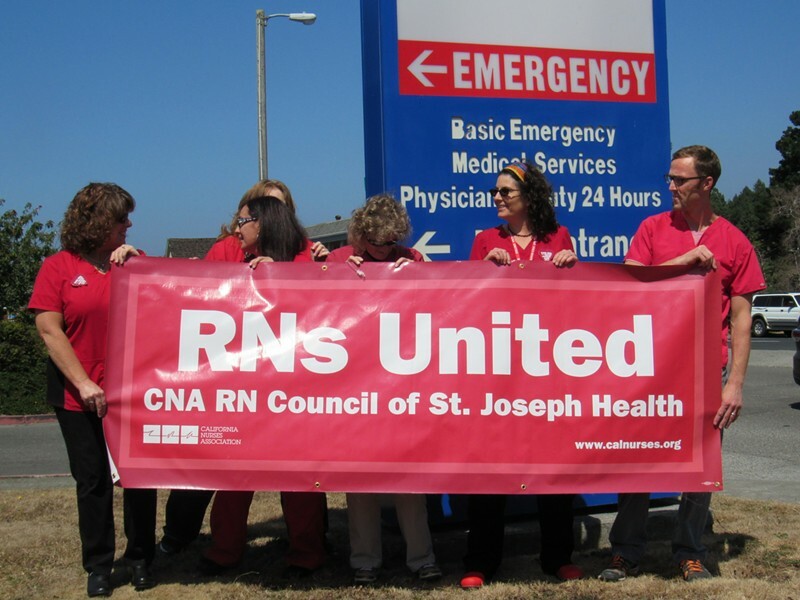 The report says nurses in the emergency department at St. Joseph have occasionally delayed giving patients antibiotics and other I.V. drips because of a consistent undersupply of Alaris pumps, which regulate the rate of medication from the I.V. Other supplies such as some formulas and I.V. tubing are also in short supply, according to James Ladika, a registered nurse who joined his fellow union members on Thursday. “If the right person asks, then they’ll find the money,” he said, adding that the concerns of nurses on the floor often went unmet. Ladika and others said that they do not have enough specialized equipment to do their jobs, and are often called on to share some equipment, such as a bladder scanner, with other departments. A patient who needs a vital test might have to wait until a piece of equipment can come from all the way across the hospital. The nurses also say that they are critically understaffed, and that patients often sit unseen in the waiting room because there aren’t enough people to attend to them. Both Johnson and Ladika expressed concern over the conditions in which they work, saying they are continually filing “Assignment Against Objection” forms when they start a shift. The forms are meant to document that workers feel an assignment is unsafe for patients or staff. “Nurses are often pressed to work under difficult circumstances,” says Ladika. One of his colleagues said they often make grim jokes in the breakroom about who has held his or her pee the longest, and that several nurses have collapsed on the job due to dehydration, stress, and urinary tract infections. Karen Gladding, another RN, echoed Green’s concerns about training. “New hires are supposed to get six weeks, they’re lucky to get two to three weeks,” she said, adding that she was “nervous about the level of care” patients were getting. The union alleges that the lack of proper training circles back to the hospital being miserly with its salaries, unwilling to double up on staff during the training period. Dr. David O’Brien, President of St. Joseph Health, said the hospital’s contribution to the community is significant. Whether charity care qualifies as the type of charitable giving outlined in the Catholic foundation’s tenets may be a matter of semantics. Every hospital provides a certain amount of unpaid care to indigent patients. The union workers have requested a number of changes, including reversal of cuts to employee disability benefits and retirement security and an investment of excess revenue into patient care rather than executive salaries. Lesley Ester, a union member and registered nurse, says that her colleagues would like to see more transparency about how the hospital’s money is being spent, and to better understand why it is understaffed. A full copy of the union’s report can be found here. Aug. 20, 2015, Eureka, CA — St. Joseph Hospital, Eureka issued the following statement regarding a report from the California Nurses Association. “St. Joseph Health began in Humboldt County more than 100 years ago with a commitment to serve the needs of our community. While it’s true that healthcare is changing dramatically, our commitment to our community and our employees absolutely has not changed. We deeply value the work our nurses and our entire staff do every day to care for our community. But we are saddened by the report issued by the California Nurses Association and do not agree with the union’s opinions or assertions.